Humility may be the greatest roadblock to closing the income gap between women and men. If women tooted their horns, asked for salaries that represent their worth (and sometimes even more) and held the same level of self-esteem men do, they would probably be outperforming their male counterparts in all areas of business. Here are three ways women can start gaining the recognition they deserve to get more comfortable with their value. Women are likely to do work or start a business that is connected to something they are passionate about. Their motivation comes from helping others, rather than making money. The art of sharing your passion with others brings about a deeper connection than when one just talks about their product or service. Your words become moving, if not inspirational. People remember you and the feeling you evoke. Humility can stop a woman from sharing her passion. We have also been trained to think more in terms of “what we do”, instead of sharing “why we do it”. As so expertly shared by Simon Sinek in his renown TedTalk – How Great Leaders Inspire Action, when we follow suit of inspirational leaders and companies by starting with our “Why” we move to attract people. This insight has also been proven through research. There is a well known saying “people buy on emotion and justify with logic”. According to Harvard Business School professor Gerald Zaltman, 95% of our purchase decision takes place unconsciously. The decision to buy is made subconsciously, based on a deep mental processing system. This subconscious decision is then communicated to the conscious mind that looks for logical justification to seal the deal. So, there is merit in sharing our passion. Since women start with the advantage of having a passion for their work, communicating this to people, prospects and current clients will give them a foot up and make attracting new opportunities an easy task. Research has repeatedly shown that men speak more often in meetings. One study in the UK found that men dominated 75% of the conversation! Because of this, women are perceived to be less competent and confident. The American culture also labels strong and outspoken women to be “pushy” and “aggressive” and favor males for these qualities. With these hurdles put to us, women need to tap into their confidence to speak up. There is a leadership paradigm, ATHENA Leadership Model® that has been found to be more intuitive and authentic to women. 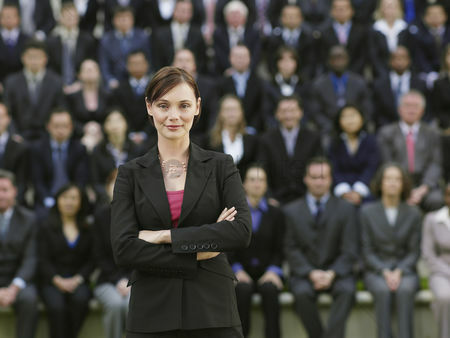 It provides eight distinct attributes that reflect women’s contributions to leadership. One of the principles is “Advocate Fiercely”. It refers to speaking up for what you believe; advocating for what you trust is right. The ability to advocate fiercely comes from an awareness of one’s passion – we are more likely to speak our minds when it relates to our passion. We’re using our voice for an act of good and providing insights with respect and compassion for others. Using this frame for speaking up has empowered thousands of women to infuse their voice into conversations instead of staying small. With it, comes a high level of confidence. Women can begin by redefining what speaking up means and how they can authentically do it. This will make the action easier and will get people to see the value they bring. Men are more apt to hire experts to help them in the business than women. This enables them to move pass challenges and areas of unknown faster and with more ease. Women who are success credit their success to more than just those who have provided them with knowledge and advice. They also found great value from people in their inner circle who provide them with moral support – the people who consistently believed in them and their abilities. Women tend to downplay the positive feedback they receive from others – feeling uncomfortable standing in the spotlight of their magnificence. By doing this, they are hijacking their success. Accepting accolades helps to boost self-confidence and self-esteem. It is a powerful reminder of your abilities and impact on others. There is nothing vain or egotistical in receiving complements, so don’t just accept them, ask for them. Over time, they will feel like a warm embrace and a great reminder of your purpose. Women are changing the business landscape for the better. We are not only seen as more trustworthy, but better contributors to the overall economic landscape of our communities. We are more caring of our clients and invest more time and energy in ensuring they get value from our products and services. To accomplish all this and more, we need to be confident in ourselves, stay focused on our passion and know that we deserve to be recognized and acknowledged by others. Cindy Gordon partners with women business owners who are working hard to generate more revenue and are curious to learn how others have succeeded.